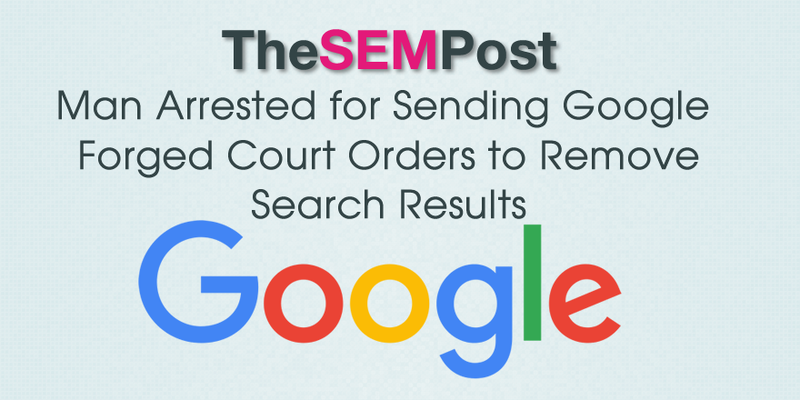 A business owner has been arrested and charged after creating multiple forged court orders which were sent to Google in order to get negative reviews about their company removed from the search results. The business owner, Michael Arnstein of The Natural Sapphire Company in New York, was arrested and charged with two counts of forging a judge’s signature and one count of conspiracy to forge a judge’s signature. Arnstein initially received a default court injunction to get 54 negative reviews removed from the Google search results in 2012, which Google complied with. But for subsequent removals – eleven of them in total – Arnstein simply asked an employee to photoshop new ones, adding new URLs he wanted removed from the search results and adding a new date to the forged court order, which bore the signature and seal of the original judge, U.S. District Judge Alison Nathan. In the complaint filing, it shows how Arnstein bragged about saving money by simply photoshopping these court orders and getting Google to remove any URL he wanted, as it seemed that Google would not independently verify the legitimacy of these court orders before removing the URLs as directed. The court filing also mentions many URLs were “unrelated to the Civil Defendants”, raising the question if he was seeking to remove reviews from other businesses or even competitors too. It is unclear how Arnstein eventually got caught, but he did submit a large number of forged court orders which may have tripped a flag. Arnstein originally sought to remove negative reviews left by a previous web designer with whom he had a falling out. But since so many years have passed – more than six years – it seems unlikely the previous web designer has been leaving negative reviews all this time, so there were likely legitimate negative reviews that Arnstein was also removing. Motherboard notes there are still 3 of the fake court order removals still listed in the Lumen Database, and some are simply from link building campaigns such as low quality guest blogs, and are not negative reviews at all, such as some of the ones listed in this removal.